Pictures from the only sunny day in Moscow in many weeks. The St. Basil's Basillica At Krasniplatz (Red Square). The notrth side, here, is being refurbished. View of the Basillica as we fly past the south side on the way to the airport. Somewhere near our hotel in midtown Moscow. Ivan The Terrible had the place built and then blinded the architect so he could not build anything better. The Kremlin is to the right and is way bigger than it looks. Inside what used to be the state department store Gum ("goom") along Red Square. Now it is an indoor mall. Yet another Moscow street scene. MTV - the world's most watched network. Outside the Tratoskovski Art Museum. No cameraski allowed inside. Another shot of the Basillica. 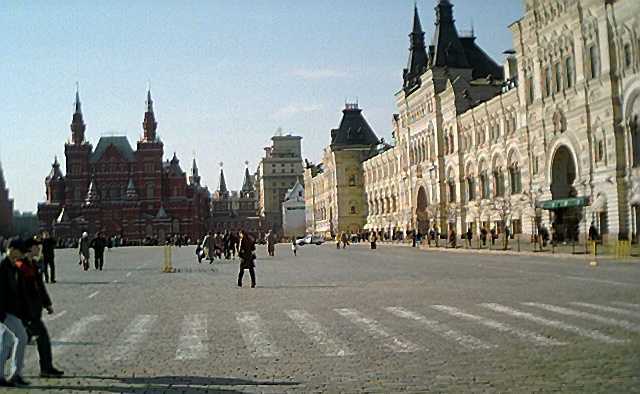 Red Square, looking to the south, toward the Basillica and the Moscow River. The mall from above is inside the building on the left. Even more Red Square. The former Gum is to the right. A view out the hotel room window.